​Hi, I'm Becca! I love to teach voice to all levels. I have an MA (in voice) from UCSC, and I am a Registered Yoga Teacher with Yoga Alliance. I grew up playing violin, singing in choirs and performing in musical theater productions - in college I found my full passion for voice. I have been committed to mindful singing practice, compassionate teaching, and a rich vocal journey ever since. I have 15 years of experience working with students of all ages, levels, and styles - including children, teens, adult beginners, as well as professional level singers. In addition to guiding students in vocal technique and helping them get in their bodies, I am equipped to support students in building their musicianship and performance skills. I'm also equipped to teach diction in several languages including French, German, and Italian. I am committed to being a lifelong student and passing along wisdom to my students, therefore I study with acclaimed soprano and master teacher Nancy Olson Chatalas, and I'm a member of the National Association of Teachers of Singing. My vocal journey has taken me from mezzo-soprano to high soprano, which makes me uniquely suited to guide students going through a vocal transition. I have experience working with transgender voices, as well as students recovering from vocal injury. I overcame severe asthma as a child, which made my singing journey a challenging one. My singing practice has been a big part of healing my asthmatic symptoms. I feel called to support others who have struggled with breath or voicing themselves – I love to educate, inspire, and empower my students and community by teaching voice and also directing choirs. I have sung with Opera San Jose, Ariose Singers, the Choral Arts Ensemble of Portland, and currently Light Opera of Portland. I also enjoy giving voice recitals featuring French art song, German lieder, opera arias, and modern music. In my free time, I enjoy reading, hiking, and spending time with my husband and "tween" daughter. Call/Text or Email today to schedule a private lesson! Visit and subscribe to Becca's YouTube channel HERE! What are lessons with Becca like? My approach to Voice Lessons incorporates some yoga to help you align your body and release tension, preparing your body to be an instrument of song - when we sing, our whole body is our instrument! After some stretching and mindful physical movement, I will lead you in individualized vocal exercises and chants and gently guide you according to your level toward your true, authentic voice. I will direct your awareness toward different points in the body, just as your awareness might be directed when performing yoga poses. We will always strive for observing without judgment. I will help you release what is standing in the way of your full expression. This is a beautiful process of getting to know your voice, your unique instrument, and thus getting to know yourself more deeply, while experiencing the joy of singing! Then your new-found skills and muscle memory will be applied in repertoire which you and I will choose together - you may bring in a song you'd like to work on, or I might choose one that is appropriate for you according to where you are in your journey. I am comfortable working with any style, especially classical, musical theater, jazz, kirtan, and folk/rock. Through lessons you will gain many more tools to use your voice in a healthy, joyous manner! Private lessons are recommended when you are needing more individualized attention or wanting to focus on specific repertoire, and weekly lessons are best especially in the beginning. Contact Becca today to schedule your first voice lesson/vocal yoga session! 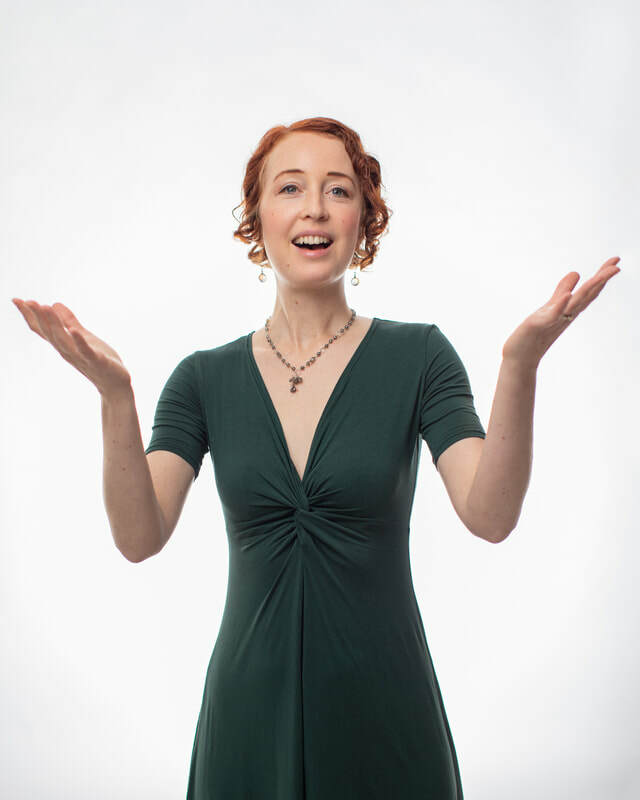 Becca is also available to lead Vocal Yoga workshops for choirs, educators, or for any group looking to explore free vocal expression. Email to schedule your workshop today! Energizing and empowering Group Hatha Yoga class with Becca, RYT, will support you in your vocal journey! Space is limited - please email writebecca@gmail.com to reserve your spot! Hatha yoga classes are a special blend of core work, alignment-based poses, and breath-based flow. Improve your strength, flexibility and balance while developing your connection with your own inner wisdom! Some meditation, breath work, and chanting at the start and close of each class, and healing essential oils interspersed throughout. All bodies and levels are welcome - props are used to help everyone access the poses, and Becca is experienced in helping with modifications. There are themes of grounding, balance, and self-care in each class. Singers and musicians will especially benefit, but all are welcome. Join Becca for exploration and rejuvenation of our inner and outer selves! Becca Stuhlbarg, M.A. in voice and R.Y.T., will lead you in exploring your own unique instrument and developing self-awareness through physical and vocal exercises. Some gentle physical asana will be performed, with the intention of activating certain muscle groups that will support the emergence of the authentic voice. Tension in peripheral muscles will be released as trust in your inner guidance, breath flow, and deeper core is developed. Vocal exercises and songs will be introduced along with simple movements, in order to invite the body, mind, and even the subconscious to integrate. Vocal Yoga can be joyous and profound, supporting your natural expression and confidence in singing, chanting, and speaking your truth. Classes are capped at 5 singers and each student will get some individual attention. Speak your truth, sing your joy! Your body is your instrument! All are welcome, including those who don't (yet!) consider themselves singers! Join me for a grounding journey of self-care in which we practice relaxing and receiving. We will consciously release tension from the previous week and set intentions for the week ahead. Props are used to allow students to practice surrendering to the pose, the breath, and the present moment. Meditation and chanting are beautifully woven in with the yin-style asana, and our voices are supported by the studio's harmonium. All are welcome - join me in supportive community to allow for what wants to emerge! NEW OFFERING: I am a doTERRA wellness advocate and am incorporating healing essential oils into my offerings - contact me today to schedule your free wellness consult!